The Washington State Department of Financial Institutions (DFI) regularly issue Consumer Alerts as the one below. It is SFA policy to published DFI alerts. However, we’ve visited the website of Clear Loan Solutions, LLC and notice that the Lender are transparent in representing the interest charges and fees. From our view point, payday loans are a rip-off to consumers. It is worth noting that PayDay Loan operators serve a niche market and are helping those who in need of emergency funds to have access to cash. 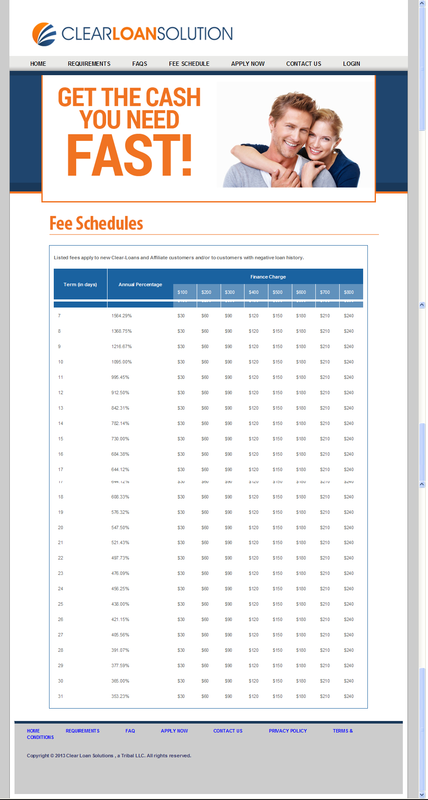 Fees and interest charges are exorbitant high but this is just the nature of the beast. If you can avoid a pay day loan, don’t bother taking one. If you can not, you will be paying 50 times the cost to borrow. The Washington State Department of Financial Institutions (DFI) has received a complaint about Clear Loan Solutions. It appears that this entity is operating as a tribal online payday lender. This entity appears to be owned by the Big Lagoon Rancheria, a federally recognized Indian Tribe exercising its sovereign immunity and subject to regulation by the United States Government. Clear Loan Solutions is not licensed by the DFI. This entity is not registered to conduct business in Washington State by the Department of Licensing, the Department of Revenue, or the Secretary of State. Washington residents are advised that state law provides in RCW 31.45.105(1)(d) and (3) that a small loan made by an unlicensed entity to a person physically located in Washington is uncollectible and unenforceable in Washington State. DFI strongly recommends that consumers deal only with those lenders that are properly licensed to conduct business. Consumers can determine whether lenders are properly licensed using the “Verify a License” feature on the DFI’s website at http://www.dfi.wa.gov/consumers/findcompany.htm. Washington State residents, if you are suspicious of unlicensed activity by a payday lender please contact the Washington State Department of Financial Institutions at 1-877-RING-DFI (746-4334), or online at http://www.dfi.wa.gov. If you feel you have been the victim of a loan scam please contact the Federal Trade Commission at 1-877-FTC-HELP (382-4357) or online at http://www.ftc.gov; or contact the Consumer Financial Protection Bureau (855) 411-CFPB or online at http://www.consumerfinance.gov. Because the scammers have access to bank account information and social security numbers, victims should consider themselves victims of identity theft and take appropriate precautions. The Federal Trade Commission has information for victims of identity theft available online at http://www.ftc.gov. If you feel you have been the victim of a loan scam involving the Internet please contact the Internet Crime Complaint Center online at http://www.ic3.gov. Don’t deal with these folks. Apart from being a scam and charging outrageous fees, they will make you waste your time with the loan process and then come back with a denial and no real reason. The one they stated to me was that there was two loan applications on file with two different SS #’s. Clearly I only filled out one and with the correct SS #. They continue to call and email daily telling me to contact them to complete the application. When I call I speak to a person named “Genesis” who tells me I was denied. I think get (that same day) more calls and more emails. Incompetence is all I can say about these folks.